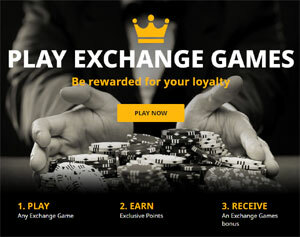 betfair Exchange Blackjack allows you to bet on a game of Blackjack, without actually taking part yourself! It's like sitting behind a Blackjack table in a casino, watching four players take on the dealer, and betting on which player you think will win! And because Exchange Games allow you to bet using betfair's innovative betting exchange, you're betting against other gamblers, rather than the house, meaning you can bet on the Dealer to win, if that doesn't go against your principles! Each game takes place over a maximum of 7 rounds and you can change your bet after each round. You can bet on any number of players, the dealer, or four 'exotic' bets - for example, you can bet that at least one player has five or more cards or that at least one hand reaches a total of 21. It's like normal Blackjack, but where your decision making is based on where to bet rather than whether to Hit or Stand! betfair states that 'each player automatically plays a perfect game using betfair Games Perfect Strategy'. They kindly provide a 'Perfect' Strategy Chart which we include here. If you compare it to our simple Blackjack strategy, you'll see that it's far from perfect! The players have no options to Split or Double Down, meaning that their game play will be fairly simple - i.e. they can only choose to Hit or Stand. This in itself isn't a problem as you're betting on who will win, rather than who will play the best game, but if you're an experienced Blackjack player, you'll need to bear it in mind when making your decision on where to bet. The other side to this coin, though, is that because you're betting on the exchange, you'll be backing your judgement against other gamblers, some of whom may not be as familiar with the game as you and who may be tempted into making incorrect decisions, based on a lack of understanding of Blackjack strategy. As with all the Exchange Games, the real fun and excitement comes from knowing that you're trying to outwit other gamblers, rather than a Random Number Generator! We'll walk you through a typical game of Exchange Blackjack round by round below. At this stage of the game, the odds offered on each of the bets is always the same (see image to the right). There's no strategy to be employed yet, so can either sit out this round and wait for the cards to be dealt, or take a punt and choose one of the available options as a pure gamble. The cards are dealt and the odds of each bet coming up change instantly! Depending on which cards at dealt at this stage, each player's chances of winning are increased or decreased and the exchange will reflect this. Some of the side bets will also now be eliminated as they are no longer possible (The 'All cards unique' bet has been eliminated). This is your first real opportunity to make an informed bet, based on your knowledge of the game and its strategy - bearing in mind that other punters may not have the same expertise! As further cards are dealt, the situation begins to get much clearer. Players are now eliminated as they go Bust, and further side bets disappear. As with all exchange betting, other gamblers will react to what just happened, giving you an opportunity to place further bets - either on your original choice or a new one. The odds on the exchange now start to separate, with some bets coming in and others drifting. This is now your chance to make your biggest bets - always remembering that you can Lay (bet against) a certain result as well as Backing (betting for) it, giving you the chance to play safe and go for the obvious or bet big on an outside bet, hoping to take someone to the cleaners! Play now continues for up to 4 more rounds, depending on the cards dealt. After each round, you have the chance to bet further, reacting to what you see - both on the table and on the exchange. This is the great part of Exchange betting - betting in-play as the situation changes, either consolidating your position or minimising your exposure. Once the game ends, all bets are settled and the action moves on to the next game - there's a game every few minutes, 24 hours a day, so you never have too long to wait! If the above has whetted your appetite, and you'd like to give Exchange Blackjack (or any of the other Exchange Games) a spin, just click on the link below and we'll take you straight there!